Occupy protesters paint a mural on Montgomery Street in front of Wells Fargo during the Occupy anniversary march Monday, Sept. 18, 2012. Photo by Andy Sweet. Protesters descended on the Wells Fargo at 464 Montgomery St. yesterday to celebrate the one-year anniversary of Occupy Wall Street with marches, music and street painting. 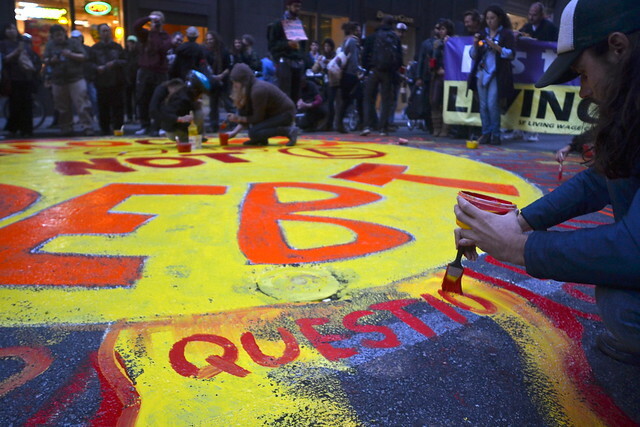 Protesters ripped up symbols of their debt, highlighted the work of several people fighting foreclosures and ended the evening by reoccupying Justin Herman Plaza. Before the mass convergence scheduled at 5 p.m., protesters clustered on Market and Drumm Streets — one of the many corners they paused at during a celebratory march. Some protesters wore Guy Fawkes masks, which have become a symbol for the Occupy movement. Others chalked up the streets with what they hoped were enlivening, rallying messages. Numerous signs stretched up above them, and one banner read, “Unstoppable, never surrender.” The remainder of the crowd donned smiles and chatted among each other or rallied for onlookers to join them. Before the scheduled starting time, Jane Smith, a member of the Occupy action council, said she expected something to go down. At the crowd’s peak, more than 400 gathered outside Wells Fargo. About 75 SFPD officers in riot gear stood among the protesters, as well as the banks and businesses on Montgomery Street between Sacramento and California Streets. Cody Lestelle writes how much debt he has on a piece of paper before tearing it up and throwing it away, which symbolizes getting rid of his debt. The Occupy anniversary march happened Monday, Sept. 18, 2012 outside Wells Fargo on Montgomery Street. Photo by Andy Sweet. The crowd covered part of Market Street and turned onto Pine Street, chanting mantras like, “Burn it to the ground” about the banks, and “Bank of America, bad for America.” Police lined on either side of the marchers through the event’s entirety, but the protests were peaceful and police made no arrests. Berry added that he understood Occupy needed time to mature as a social movement. Another SF State alumnus, Kevin Coleman, said he was pleasantly surprised at the turnout. “I think it’s changed the dialogue of national politics and put into the consciousness of Americans that there is this huge inequality,” Coleman said. 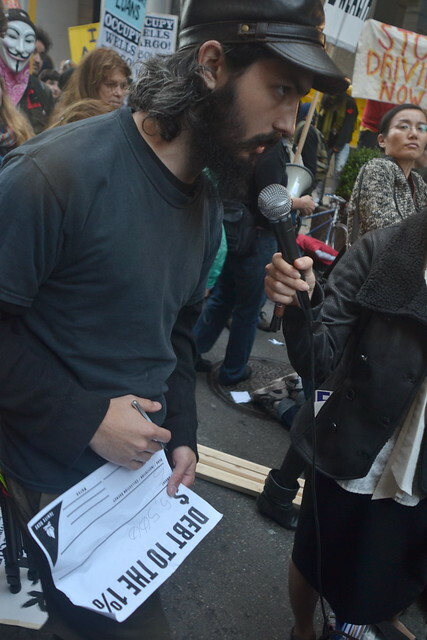 During the symbolic debt burning, Occupy members gathered around a metal trash can and passed out pieces of paper for protesters to write down their accumulated debt. They originally planned to light the paper on fire to represent burning debt, but police said they would intervene. Members shredded their debt instead. “Debt binds us all,” said action council member and announcer of the event, Amy O., who declined to give her last name. Dean Harlem stepped up to the trash can to shred his girlfriend’s debt. His girlfriend, Leanne Tallis, recently graduated from SF State after five years. He said she is approximately $50,000 in debt. A group of less than 100 protesters marched from 464 Montgomery St. to Justin Herman Plaza after night fell. “Can somebody put on Twitter that we’re back in Justin Herman Plaza?” Zach, who declined to give his last name, shouted to the group in the space Occupy has christened Bradley Manning Plaza. Danielle Steffenhagen and Alex Emslie contributed to this report.